A detailed exposition of this key book of the New Testament. The importance of the Acts of the Apostles in the plan and purposes of God in Christ cannot be stressed too much. 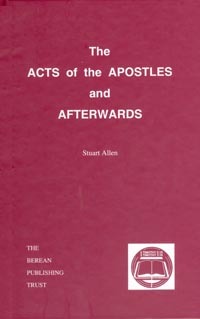 The Acts of the Apostles is one of the key books of the New Testament. Without it we should be at a loss to place the epistles, and to trace the purpose of God Who `works out everything in conformity with the purpose of His will' (Ephesians 1:11). We have therefore given it a verse by verse exposition. It is easy to miss the main object of this important book and to get side-tracked. But we have tried to avoid this and keep close to Luke's history which deals with the beginning of Christianity and the development of the purpose of God which can be traced throughout the Bible and is centred on Christ and His Kingdom. The Gospels deal with what `Jesus began to do and to teach' concerning this kingdom (Acts 1:1), and are followed by what He continued to do and teach in the Acts through the work of the Holy Spirit and the instrumentality of Peter and Paul and those associated with them. The author wishes to convey his gratitude to the friends who have assisted so ably in typing, proofing and making the indexes. May all who read the book come to a knowledge of Him `Whom to know is life eternal', with endless joy and blessing to follow.